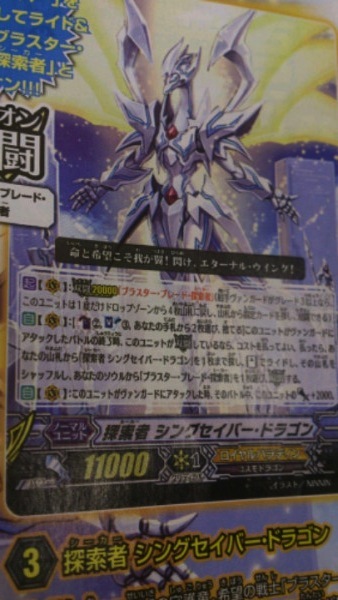 Act [V] Legion 20000 [Blaster Blade Seeker]: Once, this Unit can return 4 Units from your Drop Zone to the Deck, then search your Deck for the Unit that Legions with this Card, and Legion with it. 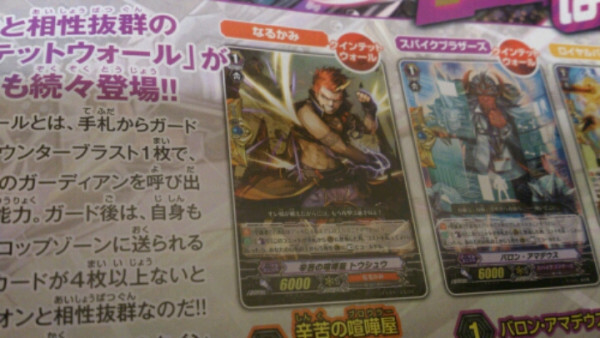 Auto (V): [CB2, SB3, Choose 2 cards in your hand, discard them] At the end of a battle in which this Unit attacks a Vanguard, if this Unit is Legion'd, you can pay the cost. If you do, Search your Deck for up to 1 "Seeker, Sing Saver Dragon], Ride it Standing, shuffle your Deck, then search your Soul for 1 "Blaster Blade Seeker", and Legion with it. Auto (V): When this Unit attacks a Vanguard, it gains 2000 Power during this Battle. Auto (R): [CB1] When your Vanguard Legions, you can pay the cost. If you do, search your Deck for up to 1 "Seeker" Card, Call it to a Rearguard Circle, then shuffle that Deck. 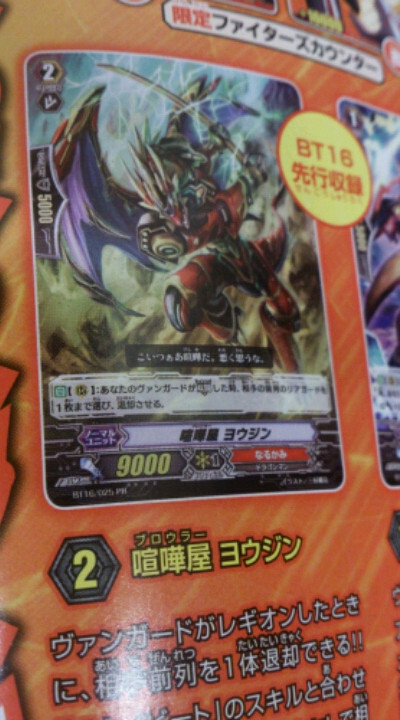 Auto (R): [Chosse 1 card in your hand, place it at the bottom of your Deck] During a battle in which this Unit Boosts, if your Unit hits the Vanguard, and this Unit is in the same Column as "Blaster Blade Seeker", you can pay the cost. If you do, choose one of your Damage Zone Cards, flip it face-up. [ACT](VC):[Counter Blast (2)-card with "Brawler" in its card name] If this unit is in Legion, until the end of turn, this unit gets [Power]+5000, and "[CONT](VC):This unit battles every unit in your opponent's front row in one attack.". [AUTO](VC):[Soul Blast (1)] When this unit attacks a vanguard, you may pay the cost. If you do, this unit gets [Power]+3000 until end of that battle. 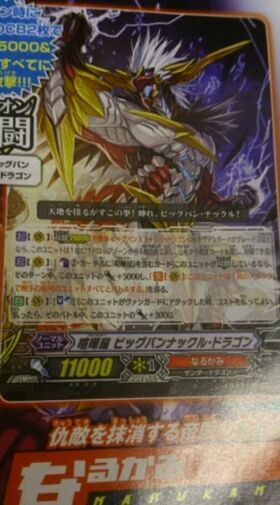 [AUTO](RC): When an attack of your vanguard with "Brawler" in its card name hits, this unit gets [Power]+3000 until end of turn. Auto (R): During your turn, when an opponent's Rearguard is placed in the Drop Zone, if your Vanguard is Legion'd, this Unit gains 3000 Power during this turn. Auto (R): When your Vanguard Legions, you can choose up to 1 of your opponent's Rearguards, reitre it. [AUTO](VC):[Counter Blast (3) & Choose one card from your hand that has the same card name as a unit on your (VC), and send it to your soul] When this unit attacks a vanguard, if this unit is in Legion, you may pay the cost. If you do, search your deck for up to two cards, call them to different open (RC), and shuffle your deck. 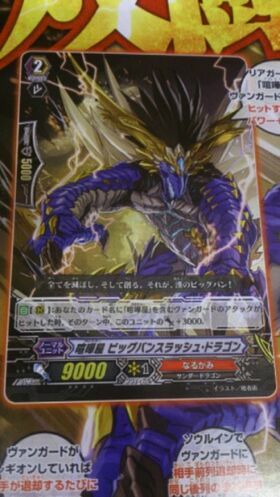 [ACT](VC):[Soul Blast (2)] This unit gets [Power]+2000 until end of turn. Auto (R): [SB1] When this Unit attacks the Vanguard, and your Vanguard is Legion'd, you can pay the Cost. 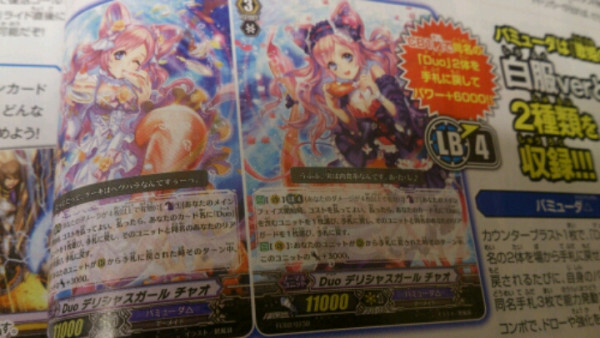 If you do, this Unit gains 10000 Power duiring this battle, then after this Battle, this Unit returns to the Deck, then the Deck is shuffled. 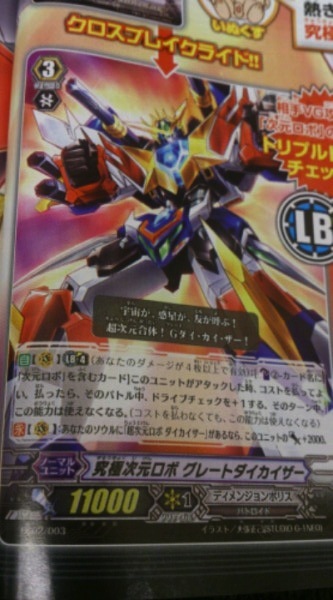 [CONT](VC):If you have a card named "Super Dimensional Robo, Daikaiser" in your soul, this unit gets [Power]+2000. 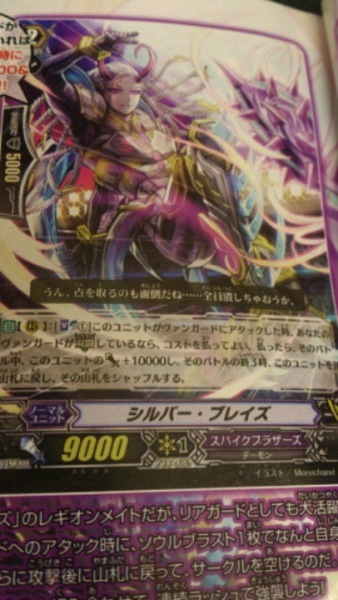 [ACT](RC):[Counter Blast (1) & Put this unit into your soul] If you have a unit named "Super Dimensional Robo, Daikaiser" in your (VC), search your deck for up to one card named "Ultimate Dimensional Robo, Great Daikaiser", ride it as [Stand], and shuffle your deck. 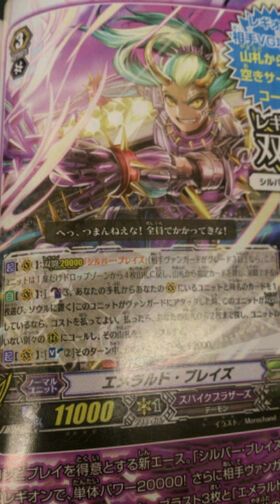 [ACT](VC) Limit Break 4 (This ability is active if you have four or more damage):[Choose one of your rear-guards with "Dimensional Robo" in its card name and put it into your soul] Search your deck for a grade 3 card with "Dimensional Robo" in its card name, ride it, and shuffle your deck, and that unit gets [Power]+4000 until end of turn. [AUTO](VC): At the beginning of your attack step, if this unit’s [Power] is 15000 or greater, this unit gets [Critical]+1 until end of that battle. 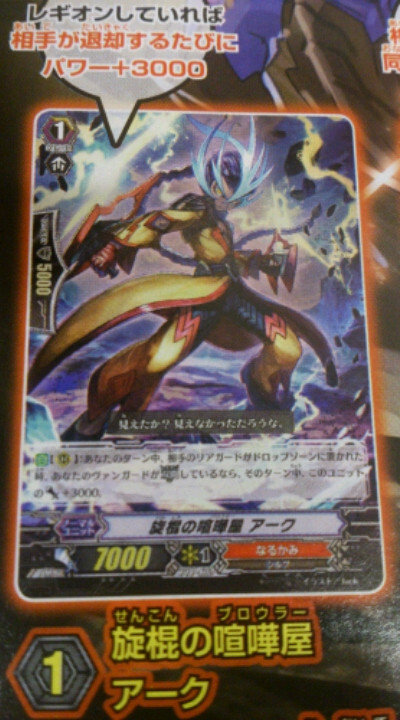 [AUTO](VC) Limit Break 4 (This ability is active if you have four or more damage):[Counter Blast (1) & Choose two of your rear-guards with "Revenger" in its card name, and retire them] When this unit attacks a vanguard, you may pay the cost. If you do, this unit gets [Power]+10000/[Critical]+1 until end of that battle. [AUTO]:[Counter Blast (1)-card with "Revenger" in its card name] When this is placed on (VC), you may pay the cost. If you do, search your deck for up to one grade 1 or less card, call it to (RC) in the same column as this unit, and shuffle your deck. [ACT](VC) Limit Break 4 (This ability is active if you have four or more damage):[Counter Blast (1) & Choose one of your rear-guard, and retire it] Choose one card from your drop zone, call it to (RC), and that unit gets [Power]+5000 until end of turn. This ability cannot be used for the rest of that turn. [CONT](VC) Limit Break 4 (This ability is active if you have four or more damage): All your units with "Я" in its card name get "[Boost]", "[Intercept]" and "[AUTO]: When this unit is placed on (GC) or intercepts, this unit gets [Shield]+5000." [CONT](VC): All of your rear-guards with "Я" in its card name are also «Link Joker». [ACT](VC) Limit Break 4 (This ability is active if you have four or more damage):[Soul Blast (5)] Look at three cards from the top of your deck, put them on the top of your deck in any order, draw one card, and Soul Charge (1). [AUTO]:When this unit is placed on (VC), choose one of your rear-guards, search your deck for up to three cards with the same name as that card, put them into your soul, and shuffle your deck. [AUTO](VC) Limit Break 4 (This ability is active if you have four or more damage):[Counter Blast (1)] At the beginning of your main phase, if the number of your rear-guard is three or less, you may pay the cost. If paid, search your deck for up to one card with "Jewel Knight" in its card name, call it to (RC), and shuffle your deck. [AUTO] Limit Break 4 (This ability is active if you have four or more damage):[Counter Blast (1)] When an «Aqua Force» rides this unit, you may pay the cost. If you do, it gets [Power]+10000, and "[AUTO](VC): When this unit attacks a vanguard, if its the fourth battle or greater that turn, draw two cards, choose one of your opponent's rear-guards, and retire it" until end of turn. [AUTO](VC): When this unit attacks a vanguard, this unit gains [Power]+2000 until end of that battle. [AUTO](VC) Limit Break 4 (This ability is active if you have four or more damage):When this unit attacks, if the amount of the cards in your soul is ten or greater, until end of that battle, this unit gets [Power]+10000, and your opponent cannot call grade 1 or greater units to (GC) from his or her hand. [AUTO](VC) Limit Break 4 (This ability is active if you have four or more damage):[Counter Blast (1)] When your "Musketeer" is placed on (RC) due to an effect from one of your cards, you may pay the cost. If you do, this unit gets [Critical]+1 until the end of turn. 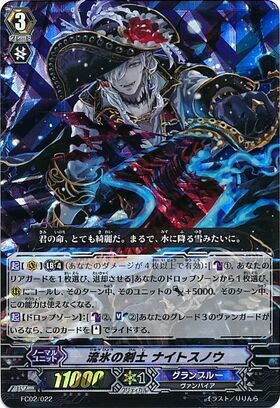 [ACT](VC):[Soul Blast (1) & Choose one of your rear-guards with "Musketeer" in its card name, and retire it] Look at up to five cards from the top of your deck, search for up to one card with "Musketeer" in its card name from among them, call it to (RC), and shuffle your deck. [AUTO](VC) Limit Break 4 (This ability is active if you have four or more damage):[Counter Blast (2)] At the end of the battle this unit attacked a vanguard, if the attack did not hit, you may pay the cost. If you do, choose your opponent's vanguard, that unit cannot [Stand] during your opponent's next stand phase. [AUTO]:[Counter Blast (1)-card with "Machining" in its card name] When this unit is placed on (VC), you may pay the cost. If you do, choose one card with "Machining" in its card name from your soul, call it to (RC) as [Rest]. [ACT](VC) Limit Break 4 (This ability is active if you have four or more damage):[Counter Blast (2)] Choose one of your rear-guards, that unit gets [Power]+4000 until end of turn, and at the end of that turn, draw a card, and retire that unit. [AUTO](VC):During your end phase, when your rear-guard is put into the drop zone, choose a card from your damage zone, and turn it face up. [AUTO](VC) Limit Break 4 (This ability is active if you have four or more damage):[Counter Blast (1)] When your unit is placed on (GC) from your hand, you may pay the cost. If you do, search your deck for up to one card with the same card name as that unit, and call it to (GC) as [Rest], and shuffle your deck. [ACT](VC):[Counter Blast (1)] Choose one of your grade 2 or greater rear-guards, search your deck up to one card with the same card name as that unit, call it to (RC), shuffle your deck, and at the end of that turn, put the unit called with this effect on the bottom of your deck. 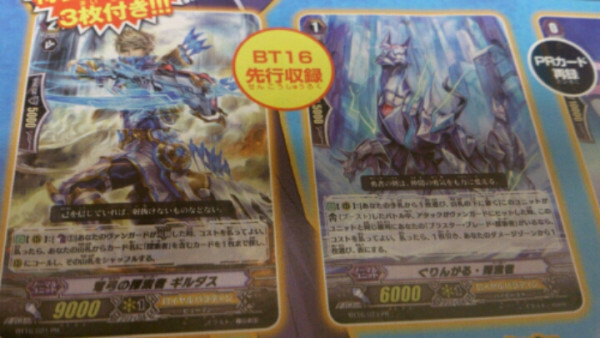 [AUTO](VC) Limit Break 4 (This ability is active if you have four or more damage):[Counter Blast (2)-card with "Blau" in its card name] When this unit attacks a vanguard, you may pay the cost. If you do, [Stand] all of your rear-guards with "Blau" on its card name in the front row. [AUTO](VC): During your battle phase, when your unit becomes [Stand], this unit gets [Power]+2000 until end of turn. [ACT](VC) Limit Break 4 (This ability is active if you have four or more damage):[Counter Blast (1) & Choose two cards from your hand, and discard them] This unit gets [Power]+10000 until end of turn, if the number of cards in your opponent's hand is four or greater, choose two cards from your opponent's hand at random, and bind them face down, and at the end of that turn, your opponent puts all those cards that were bound with this effect into his or her hand. This ability cannot be used for the rest of that turn. [AUTO](VC):When this unit attacks, if the number of cards in your hand is greater than your opponent's, this unit gets [Power]+2000 until end of that battle. Auto (Vanguard) [LB4]: [Counter Blast (1)] At the start of your main phase, you may pay the cost. If you do, choose one of your rear-guards with "Duo" in its card name, return it to your hand, search your deck for up to one card with the same name as that unit, put it to your hand, and shuffle your deck, and afterwards choose one of your rear-guards, return it to your hand. Auto (Vanguard): When another of your units you have is returned to hand from Rearguard Circle, this unit gains + 3000 Power until the end of turn. 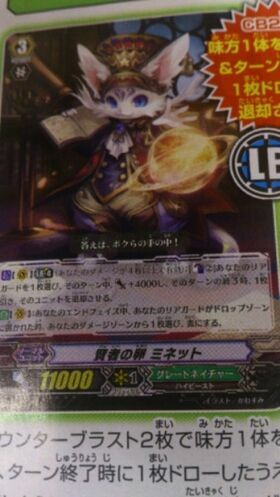 Act [CB2] Search your Deck for up to 1 "Alfred" Unit, ride that card ontop of this Unit, then select a Vanguard and it gains 5000 Power for this turn. Auto (? ): When this Unit attacks a Vanguard, it gains ?000 Power. 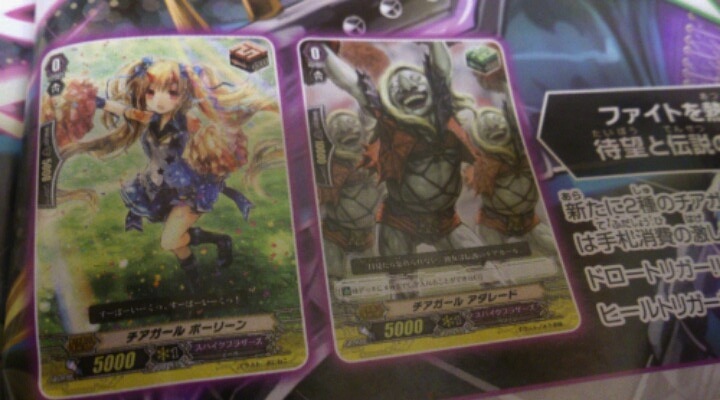 Next month will give Bermuda Triangle Legion as two promos! Don't wanna seem like a total pain and all but, could you maybe put what clan these are for? Or at least those without images? Figured common sense would've told you but I edited what belongs to what clan. I'm assuming a lot of the singleton clan cards are for Fighters' Collection 2? They all seem pretty alright imho. Brawlers and Seekers definitely showing how aggressive the Season 4 format shapes up to be. The new Megacolony breakrides are stupidly powerful. Losing out on your natural Twin Drive every turn is incredibly devastating, not to mention all of the pressure the Rearguards can put on you if their Units hit. Echo of Nemesis is great because no Perfect Guards. The Link Joker boss is hilarious because Morikawa.dek. Great Daikaiser + Commander Laurel = gg. I really like Emerald Blaze, but I've also never touched Spikeys in my life. It'll be interesting to see how to deal with so many new cards.